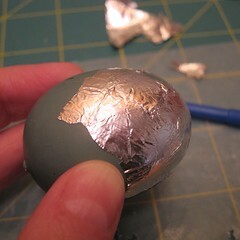 I was playing around in my craft room the other day trying to think of a way to make gilded eggs with what I had on hand. Then I realized I didn’t want golden gilt, I wanted silver eggs. A couple hours later, I had these. Oh my gosh, I couldn’t be happier with how they turned out. 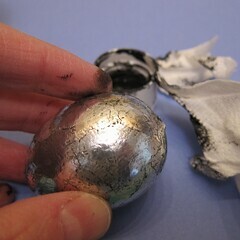 Who would have thought I could get a look of hammered, antique silver with just plastic eggs, tin foil and black paint?! They’ll be a great centerpiece for my Easter table. Update 3/2/15: I’ve tried this technique on a couple of different things since this post, a bunny statue and clay icicles. It worked well on both, but it is a little tricker to get something with lots of indents and such in it as smooth and antiqued as easily. I have some tips on the post about the bunny. 1. 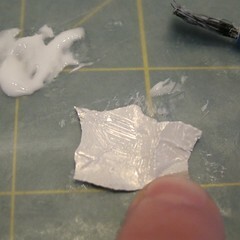 Tear the tin foil into small pieces, about 1/2 inch in size. (You can make the pieces smaller or larger if you wish, but keep in mind the black paint will sit in the edges, so bigger pieces will give you less lines and smaller pieces will give you more.) 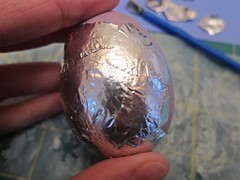 Make sure to rip off the zig-zag edge where the foil is ripped from the roll. 2. 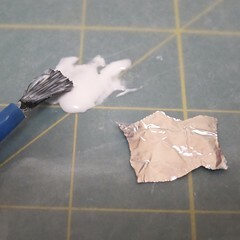 Use a small paintbrush and cover the dull side of one tin foil piece at a time with a thin coat of glue. Make sure to get glue on the edges and into the corners. 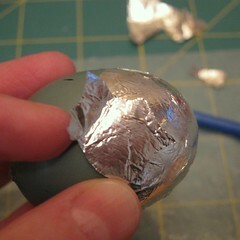 Place the tin foil piece glue side down onto the egg. Press into place. Continue adding pieces overlapping so no egg shows through. 3. After you have a few pieces of tin foil on and they have had a few minutes to set, use the knitting needle or chopstick to smooth down the tin foil. It will not be perfect, but smoother than before. Don’t worry if some glue oozes out, you’ll clean it off later. You can see the difference before and after smoothing here. It takes a little time to get the hang of it, but the look is worth it. Continue steps 2 and 3 until the egg is covered and as smooth as you like. 4. Dampen a piece of paper towel with water and wash off any excess glue. 5. Dip a small piece of paper towel into the black paint. 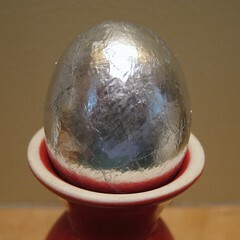 Rub onto the foil covered egg and then quickly rub off just leaving a little in between the pieces of foil and other scratches. Play with adding more and wiping more off until you get as much black as you want. 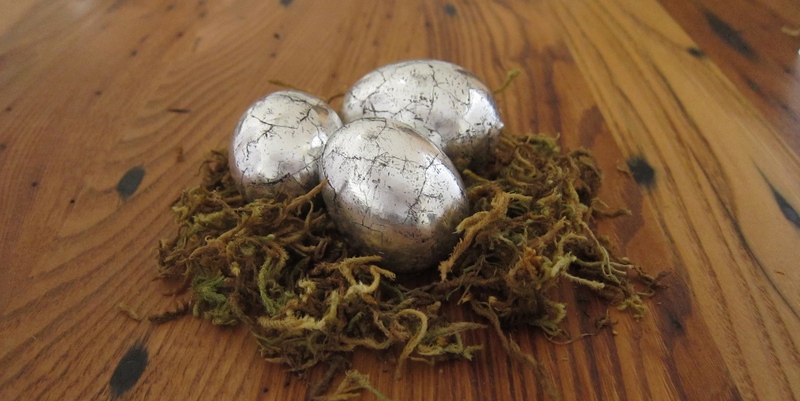 I went around the eggs twice with the black paint, wiping it off between laters, to get the antique look I liked. These turned out beautifully. Someone is getting ready for Easter decorations. Well done. Wow! I’ve never seen tin foil look so good. I want to gild everything in my house with it now. I love these! I bet the effect will look just as great with some big pieces of gold leaf. I bet craft stores have some different colors of the same foil material.. hmm you have me excited to decorate for Easter! Yes, you can get leaf in different colors at the craft store. From what I’ve seen it is a bit more delicate than using tin foil. 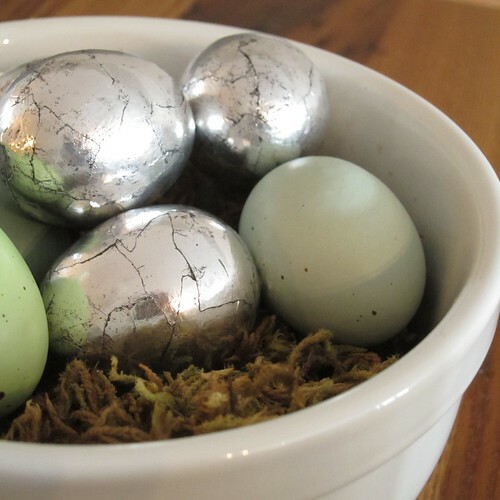 But a bunch of metallic eggs in different colors would be beautiful. Whoa, these turned out truly lovely! 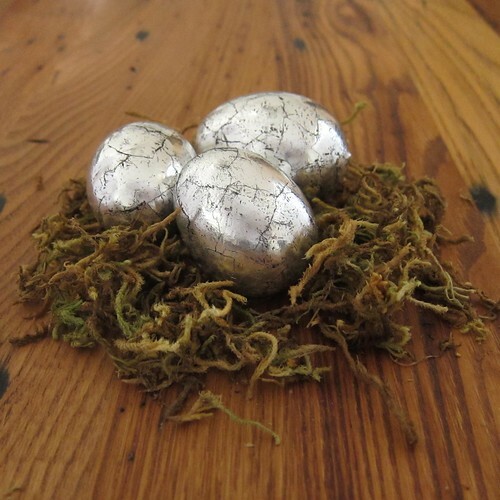 Not only will I be making your silvery eggs, I’m going to try your technique on some old Christmas balls for decor balls. And perhaps a candlestick? So creative and clever! Let me know how they turn out. I’m thinking Christmas balls for next year too. I want to do a bunny as well but worry about smoothing it out nicely on a not so smooth surface. I’m going to try it with actual plastic eggs, you know the type that open? I’ve got some resin eggs, but they were fairly expensive. Plus, I want to experiment with some different techniques. Thanks for sharing. I’m interested to hear how it works on those cheap plastic eggs. This technique is amazing! I had so much fun making the eggs! Thank you for sharing. Oh, I’m excited someone else tried making these! What kind of clear coat/shellac/urethane would you recommend using on the finished product? I’m concerned about longevity with storage etc… Ps this project is AWESOME and my attempt turned out wonderfully! Tha Ks for a great post! Hmmm, I’m not sure what would work best. I’m afraid if you brushed something on it might take the black off. I would try polyurethane maybe and experiment on piece of foil with the paint on it. Or perhaps dip the eggs in it. I used a plastic 2-piece egg and it turned out fine. Tried a glaze with gold and black too. Our group will make these on February 13. Thank you for the idea. Oh, thanks so much for letting us know Connie! What type of acrylic paint should we use? Craft? Artist? These are wonderful! Can’t wait to make some. I just used those small bottle of acrylic paint you get in the craft shop, I think they are brands like Folk Art or Americana. I guess I would call them craft paints. How fun! Can’t wait to try this! Thanks. These are beautiful! I’d like to do it on Seashells too! That would be pretty. I’ve done a bunny and some icicles for my Christmas tree since the eggs. I did just use regular foil from the grocery store. Here are a couple of things I can thing of. Some of the foil might be on wrong side up. Perhaps there is some glue on the outside that needs to be wiped off with a damp towel. The foil isn’t smoothed enough. You haven’t wiped off enough of the black paint. I hope you can get the shine you want! I love idea! How clever! A suggestion-when I made Japanese washi eggs, which involves putting origami paper on eggs, they said to smooth the paper down with the back of a spoon, and that worked very well. I can’t wait to make these! Thanks for sharing! I found this after Easter but I am still going to try it! Thanks! Just found this. I love the idea and am going to try this. ILm also going to try gold foil that I use to cover cake boards. Thank you for a wonderful idea.